Who better to explore the world with than someone who's new to it? This ALPHIE robot is on a "field trip" from his home planet and, with a kooky grin and funny faces, it's his "mission" to explore the world! There's practically nothing this little dynamo doesn't want to "talk about" -- from letter sounds and shape sorting to patterns, cause and effect, vocabulary development and much more, your ALPHIE robot is like a classroom in one little portable robot buddy. Educational fun on-the-go is as easy as can be, too, with this little guy's handled noggin and storage spot for his cards in his backpack. There's a whole lot to discover when you're a preschooler and this ALPHIE figure shares one of the most important lessons, too: learning can be tons of fun! Robot figure comes with 30 double-sided cards. (Includes 3 "AA" batteries). With an adorable appearance and a friendly voice, the princess was instantly drawn to Alphie the Robot! With B starting school this year, she has been eager to learn, just like her big brother so we have been looking for new ways to engage her and teach her number's and her ABC's. Alphie is the perfect learning companion! With adorable facial expressions he asks questions (each card contains several questions), and reacts accordingly to your child's answer, providing encouragement in the learning process. With the available expansion packs (Alphie also comes with 30 double sided cards) the learning adventure doesn't have to stop! The princess has a tendency to retain information better through repetition, and with Alphie she can learn at her own pace in a fun and friendly way. Alphie is now a beloved friend for the princess! 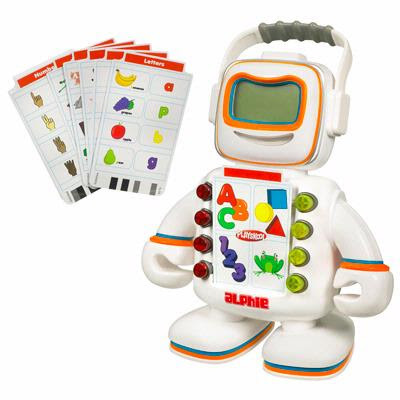 For a fun and relatable way to teach your little one check out Alphie the Robot from Playskool. Alphie the Robot would make a great gift this Holiday Season! Learning FUN! One Lucky reader will receive an Alphie the Robot! Leave a comment~ Visit http://www.hasbro.com/playskool/en_US/ and let me know another item that you would love to gift or receive this Holiday Season. 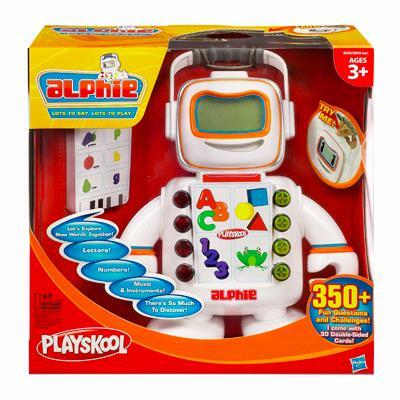 2) Tweet ~ #WIN Alphie the Robot by Playskool! Interactive Learning FUN! http://bit.ly/f5lUqh @savvycouponmom #GIVEAWAY #Holidays (can be repeated twice daily for additional entries~ copy paste please~cut and paste- the bit link must be posted in the tweet - I will check) (Additional 5 Entries - 5 Comments). Entry to this giveaway ends at 12pm PST January 17, 2011. Winner's are chosen randomly through random.org. The winner will be announced in a post within 7 days of the giveaway ending, and contacted through email. The winner will have 48 hrs. to respond or another winner will be chosen. I'm a follower. My son would also like the Mr. Potato Head Spud Lightyear. P.S. Enter my giveaway if you'd like! I haven't seen Weebles since I was a kid. I'd love to give the Weeble Musical Treehouse to my niece. My daughter would love the Weebles playsets! Following you on Twitter @ThisLittleFam! I entered the Hayneedle Giveaway.